What? Excuse me? 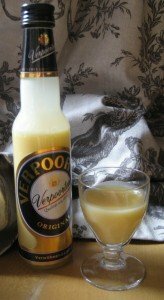 You think of Eierlikör aka Advocaat as strange gloopy stuff? Oh please, rethink. After all, mixologists presently revive all kinds of colorful sweet concoctions from Granny‘s and Auntie‘s drink cabinet. Eierlikör is actually a Dutch creation, but counts among the culinary peculiarities most Brits classify as ultra-German and utterly bewildering. Ok, this mixture of egg yolks, sugar, cream and alcohol may seem to be a somewhat unusual drink – but poured over walnut ice cream, it’s simply irresistable. Its origin is said to lie with Dutch colonialists trying to imitate a creamy mixture of avocado („advocaat“) pulp, cane sugar and rum they had been offered in Brazil. Back home they used egg yolk instead of the exotic fruit. Homemade Eierlikör is even creamier than the standard industrial versions, but I also like the green „original“, which admitttedly is more of a dessert than a drink. Here are two recipes – enjoy! In a bowl beat the egg yolks with the sugar and cream, using a handheld mixer. When the sugar has dissolved and the mixture is very creamy, lower the speed and add the alcohol. Fill into a clean bottle and store in the fridge for at least day, consume within three days (if you want to be on the officially ultrasafe side). 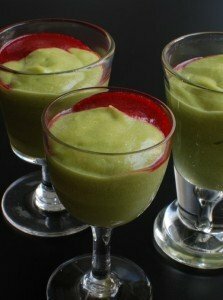 In a blender mix the pulp of the avocado with all the other ingredients at medium speed until very creamy. Pour into two stemmed glasses and refrigerate for at least an hour. Consume, or rather savour, with somebody you really really like. If you enjoyed reading this, you might consider clicking on the button below and supporting me in my work. I’d be more than happy. Thank you.